The ONSIDE project partners met for the fourth time in Bucharest, Romania on 26 and 27 March to learn more about the referee development activities of the Romanian Football Federation (RFF). 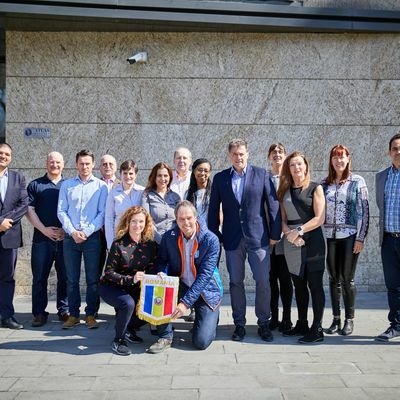 The meeting, hosted by the RFF, saw project partners updated about the formation of the International Federation for Sports Officials (IFSO), which was established in The Hague, Netherlands on 8 March 2019. During the first day, ONSIDE partners focused on validating the Occupational Map and Occupational Descriptor for sport officiating in Europe. The Map and the Descriptor together describe the landscape of sport officiating and the key structures and organisations within it. The next meeting for the ONSIDE project is scheduled for September 2019 in Malta. The ONSIDE project aims to research and define the concept of sport officiating in Europe, develop occupational standards to outline generic skills and performance requirements, and finally, create innovative education products for both face-to-face and online. The ONSIDE project is co-funded by the European Commission under the Erasmus+ Collaborative Partnerships in Sport programme. All project partners: European Observatoire of Sport and Employment (EOSE), Sports Officials UK (SOUK), Association Française du Corps Arbitral Multisports (AFCAM), European Handball Federation (EHF), European Table Tennis Union (ETTU), European Athletics, SportMalta, Dutch Olympic Committee*, Dutch Sports Federation (NOC*NSF), Romanian Football Federation (FRF), British Wheelchair Basketball, National Sports Academy “Vassil Levski”.